I am noticing So many of the ATP tour pros wearing Mizuno shoes and clothing, especially pros that are ranked outside of top 30. That means Mizuno is going after as many touring pros as possible aggressively. Does Mizuno have great products ? ATP tour pros wouldn't wear them if they are 2nd rate, right ? and would TW carry Mizuno in the future ? I am sure Mizuno would love to have their product in USA with biggest Tennis mail order company in USA. We have been inquiring with Mizuno for the last couple years now. I will let you know if we have any updates in the next couple months. I attended to the quarter finals in ATP Barcelona last week. I saw so many players using Mizuno Wave Exceed Tour 3. Some of them like Karlovic, Baghdatis or Kohlschreiber seems to be sponsorship by them, as they clothes are also Mizuno. But there are a lot of pros sponsored by brands ( doesn´t make shoes) that were using Mizuno shoes, as Roberto Bautista (outfit Lacoste), Muller (outfit Segio Tacchini),Jaziri or Kovalik (outfit Hidrogen). A top player as Novak Djokovic will be paid for using Barricades or Asics resolution with his Unilquo or Lacoste outfit, but this type of players (not top 10 if you do not consider Roberto) maybe choose Mizuno because are great shoes, maybe superior to others from Big Brands (Nike, Adidas, Asics...). By the way, TW Europe does sell them. Does Mizuno shoes also have great cushioning and support ?? It seems like Asic and yonex shoes have some of the best techknowledge In the world in them. It seems like ATP pros are realizing Mizuno makes great shoes as well. I wonder if Mizuno can compete with Asic ? Interesting. Sounds like they have good shoes. I haven't yet seen a Mizuno outfit that I dig though. Mizuno Wave Exceed Tour 3, they sell it in TW Europe. This WAVE Exceed tour 3 is Loaded with NEW techknowledge. it sounds like one of the best shoes in the market with modern day tech. Upper: Lightweight 3-D solid upper provides a natural, comfortable fit and durability. Premium 2-layer sockliner. Midsole: PoWnCe midsole offers maximum lightweight, responsive cushioning. D-Flex Groove and SR-Touch helps transfer energy into every step. Ride the wave to victory with the Wave Exceed Tour 3. 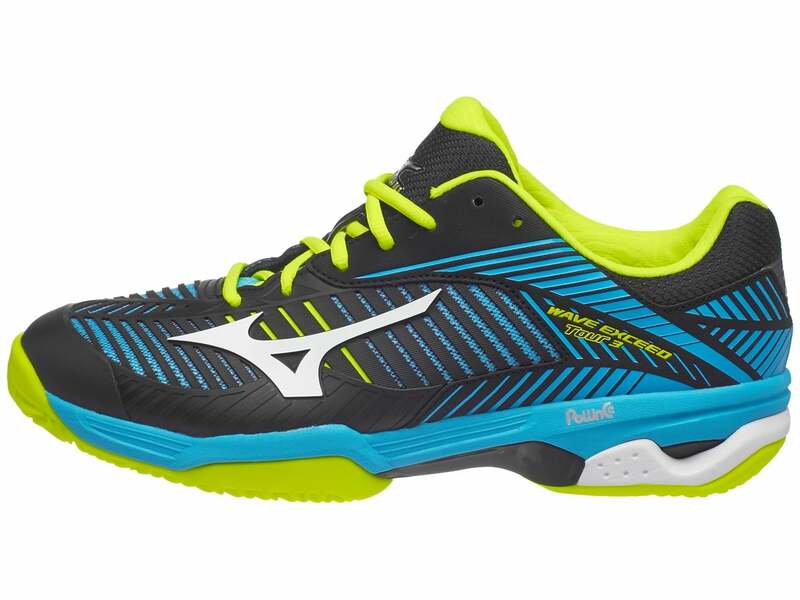 Anatomically engineered to perform at an elite level, the cushioned Mizuno Wave technology provides comfort and support while keeping your ankle locked in the right position for sharp and aggressive movements. The lightweight midsole provides responsive cushioning and stability for quick twists and turns, while D-Flex Groove technology allows for explosive acceleration. A durable all-court outsole will offer great traction on any court surface, and a new upper provides a natural fit with improved resistance. I had a previous version of Wave Intense Tour. They are nice shoes with good support and cushioning. I bought size 9, and those were at least a 1/2 size bigger, so I wore them with two socks. But during the winter season (December–March) I played about 8 hours a week on hard and carpet and the outsole didn't take it well. Will be trying Break Shot on sand this week. I have tried on Mizuno running shoes but not tennis shoes. The running shoes didn't feel like it had much cushioning. So if the tennis shoes are anything like them I would vote no. I find it impossible to find their tennis apparel. However I got their shoes, the Exceed Tour 2 and Tour 3. Got the Tour 3 first and honestly although it looks cool, I'm not really a fan. It's too narrow even for my somewhat narrow feet and it sits higher than it looks so the top of my foot feels jammed. Then I received my Tour 2 and wow it's like a completely different shoe, love those! I bought the Wave Exceed Tour 2 from european site and having been wearing them since November. They are very comfortable and light feeling on the court. However they do run a bit big so if I order again I'll have to go down half a size. How is the cushioning ? Is it as Good and supportive as the Top shoes in the world today ? Like Asics, Nike, or Yonex ? Cushioning was my main concern. durability isn't really a issue for me since I have get a new shoes every 3 month anyway. So you are saying, cushioning wasn't as Cushy as top shoes like Asics Gel cushioning or Yonex power cushion ?? Not as cushy but more plush than Vapors or adizeros or any other speed type shoe. I will be ordering Exceed Tour 3 soon to replace these. Mizuno EU has the exceed tour 3 at 330 grams...that’s about 11.6. The exceed tour 2 was slightly lighter at 320 grams. That’s on par with the Babolat Jet Mach 3 at 11.7 oz. Nike Zoom Vapor X is about 13+oz. What ??????????? LOL. they must be made for performance to compete with other super light performance tennis shoes in the market.....11.6 OZ must be one of the lightest shoes I have ever seen. even the Vapor X weight 13.6 OZ or so and this has Better cushioning than Vapor X ?? how did they do that ? Is it that new POUNCE tech ? It’s definitely their cushioning system. I was drawn to Mizuno because I had plantar fasciitis and the cushioning on their running shoes helped me a lot during recovery. So when it healed I was interested in their tennis products and didn’t want that injury to happen again. I definitely will stick with this brand and hope that their reps can get the products to be readily available in the U.S. I have to buy these shoes and try it. I too have Plantar fasciitis. If cushion is better than Vapor X and shoe is so light,, that is a game changer. but you said cusion isn't as Plush like Yonex power cushion, right ? I have been wearing Yonex and I did enjoy the plush pillow like cushioning for several years now. I’m not familiar with Yonex shoes but it sounds to me that it won’t be as cushy. Also look at the Wave Intense. It’s a heavier shoe and supposed to have more cushion than the Exceed Tour. I just prefer a speedy light shoe for my game. I had Mizunos back in the day when I played Volleyball. Them & Asics used to be THE shoes in the Volleyball market. I liked them, well made shoes w/ great cushioning. Wouldn't mind trying a pair for tennis if they ever came out. @Dean M you said you had plantar fasciitis, do you have flat feet as well? I have flat feet and am curious how these shoes would feel on me. @Moosch yes my feet are relatively flat (but not too wide) and had this injury in my 20s late in my college career, and it came back a few years ago in my late 30s when I took up competitive tennis again. Each time I’ve done physical therapy with a lot of stretching and switched to stability/motion control running shoes (ASICS and Mizuno seem to work for me) and this time switched to Mizuno Tennis as well and it’s been working out well so far. I’d give the Wave Exceed Tour a try if you like fast light shoes or the Wave Intense if you prefer a heavier stable shoe. I just purchased the Wave Exceed Tour 3 Clay from the TWEurope site. I am really excited to try them out! ALSO, since there are now new models out, all the ones posted here are all literally HALF off! Anything over 100 euro is free shipping.... Except for the US. I tried to take advantage of that by getting 2 pairs to save on shipping, but it is most likely just for European countries. Shipping to us is about $25, which made my order just over $100 for the shoes, but still cheaper than they were earlier in the year. 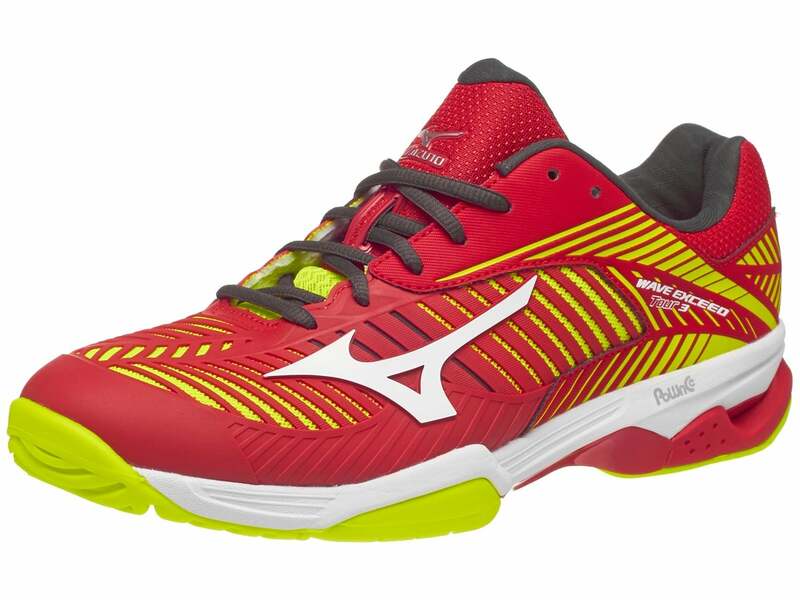 Take full advantage of Tennis Warehouse Europe if you want to try Mizunos. @Nostradamus don't know if you're still interested or have a pair already. They are wonderful shoes, i highly recommend trying them, for me they are the best. Mizuno's USO apparel looks really good. How are the Exceed 3 working out for you so far? I'm going to make a few purchases (Exceed Tour 3 and Intense 4 possibly)...I wore out my all court Exceed 2 and still have my clay version as well. Tried the Nike Vapor X recently and the fit is not as good as the 9.5. Also my Ubersonic 2 gave me heel blisters during my sectional matches, so I think I'll go back to Mizuno. I just bought them @Dean M, currently in route to me. I'll let you know when I get them and get to use them for a couple weeks. Do any of the Mizuno shoes offer a six-month warranty? I saw a Mizuno store during my recent vacation to Seoul. I really wanted to try on some of their tennis shoes but the largest size the store carried was Men's size 10 or 10.5 in any of their shoes. I was quite surprised by this as surely there must be many guys in Seoul with bigger feet. I cant wear anything but Mizuno. I need the stability shanks that the others dont offer, I love folding my friends shoes up like an accordion, but they cant do that to mine. My feet are very narrow... size 25.5JP/ Womens US size 8.5AAAA. So yeah, limited to what fits, my feet slide around in everything else and cause blisters on the bottoms of my feet and all around my heels. American shoes just dont offer narrow sizes unless you custom make them, at an unreasonable cost. if you watch the Early round of US open,,, literally 1/2 of the pros are wearing the Mizuno shoes. lol. they are blowing Asics out of water even though many claim Asic is more comfy. Allow me to up the cringe factor here. I wear Wave Bolt 6's on the court. Yes, not even a tennis shoe, but a Volleyball shoe. Just an interesting feature I need is the extra lateral support that the tennis version dont offer. I know they are heavier, but its a trade off I need for the support as I have flattened every other Mizuno tennis shoe mid sole out I have worn. I thought Bradley Klahn's Mizuno outfit and shoes looked good. I didn't even realize Mizuno made tennis stuff till I went to the US Open this year and it was everywhere. I have had Mizuno shoes in the past when I played volleyball, so I would be very open to trying their stuff for tennis as well. Unfortunate, I just checked, and they don't make the same sizes in tennis as they do volleyball for shoes... volleyball they make to a size 17, but tennis they stop at 13. I guess I'll never know what their tennis shoes are like, since I'm a 15. I'll just stick with New Balance. I understand your shoe finding pain. I am a size 14 and I can hardly find a decent shoe in my size. These manufacturers just do not know the part of the market they are losing out on. Even of they had some in those sizes they could see how well they sold. So I received my Wave Exceed Tour 3 Clay and have about 10 hours of court time logged in. And I must say, they feel fantastic. I have flat feet so finding the right shoe is not easy for me. They hug my foot wonderfully. Good space for my toes, no slippage, great court traction. I have had a couple previous pair during the last year that were pretty good, but not to this comfort level. My last couple pairs in comparison were the Adidas Barricade Classic Bounce, and Adidas Gel Solution Speed 3. The Asics issue I had was the toe of the shoe. It's too narrow, so I had pain in my pinky toes after any match or play lasting over an hour. They also gave me blisters on my big toes if I played for close to 3 or more hours. The Adidas were quite different. For me they were very loose and bulky, thus giving me foot issues in long matches and game play. 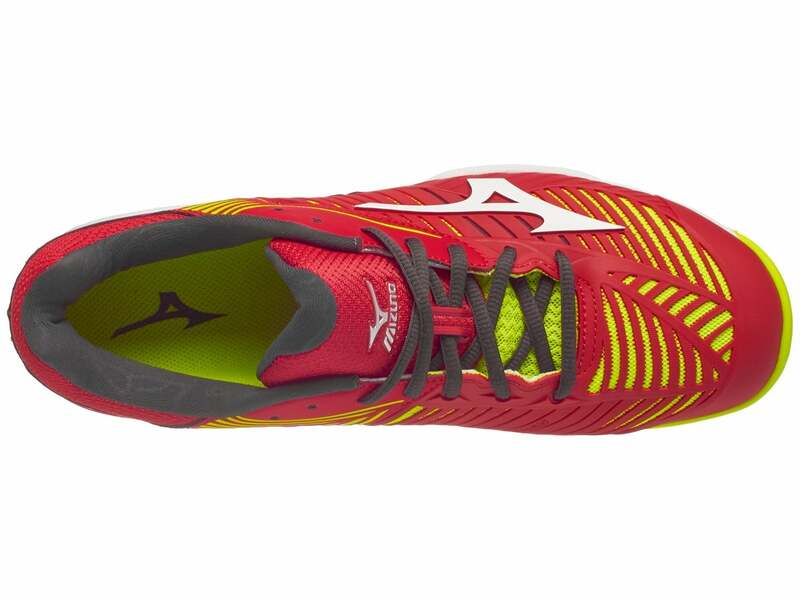 To me, the comfort with Mizuno exceeds both Gel-Resolution and Barricade. In regard to support, I feel it's better than Gel, but Barricade I'd say has a slight edge over Mizuno. Took this one today after a wash out. Wildlife took over the courts. 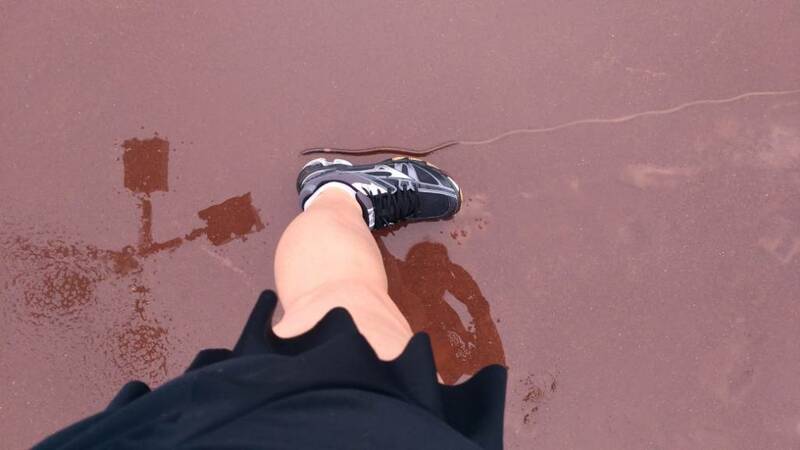 These Mizuno shoes are savages on clay, my preferred court.